Cuisinart Food Processor Dicing Kit 13-Cup 550-Watt Touch Pad Control LED Light. Tackle food prep tasks both large and small with the Elemental 13 cup Food Processor. The NEW dicingdisc features a 10 mm screen for dicing food into perfect squares and weve also included a cleaning tool to keepit in top operating condition. The 13-cup work bowl easily handles larger quantities of ingredients, making itperfect for big family meals and entertaining the bonus 4.5 cup bowl is ideal for smaller amounts. 2-stainlesssteel blades and two discs make quick work of chopping nuts, pureeing soup, slicing tomatoes, shredding cheeseand more. The high gloss base adds high style to any kitchen. 13-cup large work bowl and 4-cup smaller, inner nested work bowl. Exclusive patent-pending seal tight advantage system seals bowls and locks blades. Supreme wide-mouth feed tube with small, medium and large pushers. Dicing disc with 10 mm grid plus cleaning tool. Stainless steel chopping/mixing blade with patented blade lock system, including dough blade and smalland large S-blades. Stainless steel reversible shredding disc (fine/medium). Electronic touch pad controls high/low/off/pulse with illuminating blue LED lights. : 10 in Product Height in. : 20 in Product Width in. : 19.75 in Appliance Type: Processor Blade Material: Stainless Steel Color/Finish: silver Color/Finish Family: Silver Detachable Spindle: Yes Dishwasher Safe Parts: Yes Features: No Additional Features Full-Size Feed Tube: Yes Locking Lid: Yes Product Weight lb. 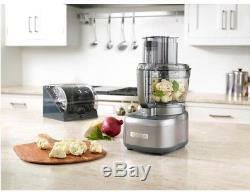 Cuisinart Gun Metal Gray Elemental 13-Cup Food Processor and Dicing Kit. The item "Cuisinart Food Processor Dicing Kit 13-Cup 550-Watt Touch Pad Control LED Light" is in sale since Tuesday, November 13, 2018. This item is in the category "Home & Garden\Kitchen, Dining & Bar\Small Kitchen Appliances\Food Processors". The seller is "goshopawesome6" and is located in Meridian, Idaho.